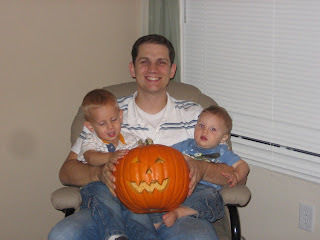 The Haynie Clan: Pumpkin Carving!!! On Friday some friends of ours invited us over to carve pumpkins. 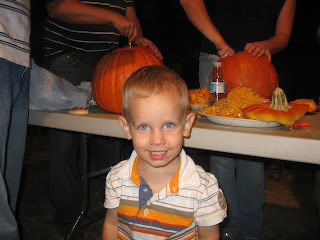 Reid did a great job at carving and even did the dirty work of cleaning the pumpkin out. 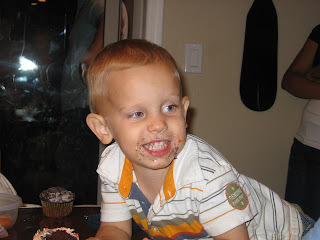 Cameron tried to help and even ate some of the scrapings. I think Cameron had more fun eating the cupcakes that someone brought and Luke just hung out in the stroller. We had a really good time and enjoyed spending time with friends. how fun! Tell Reid I said it looks good :) yeah we bought 7 pumkins so we are doing some serious carving tonight for FHE. Reid and I have been married for 8 years now and have had a blast! We have been blessed with three sweet boys. 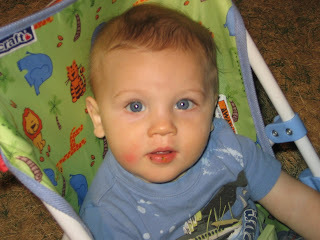 Cameron was born in May 2005, Lucas was born in January 2007 and Owen in July 2009. Cameron is in first grade and He loves to read and spend time with his brothers. He also loves to do little projects at home. Luke is in preschool and is learning so much and loves playing soccer. Owen is our sweet and very happy 2 year old. He is always on the go and is such a good little guy. I just love these boys to pieces. We all have such a blast together. I love having the opportunity to be a stay at home mom and getting to spend my days with these 3 boys, while Reid is an estimator and works for a company called BSB Design. We are loving life and look forward to what is to come! Find Joy in the Journey Now!!!!! There's someone i'd like y'all to meet!